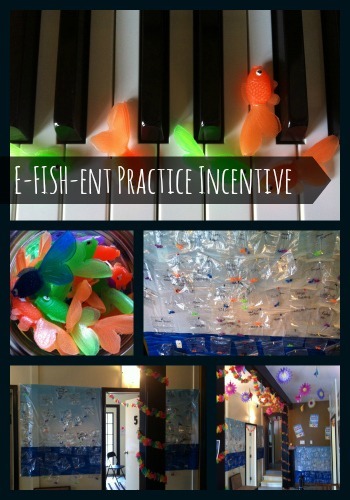 Home / Free Printables / We Have An E-FISH-ent Piano Practice Incentive Just For You! We completed a studio-wide practice incentive in March at our studio and are excited to share it with you today! This practice incentive focuses on helping your piano students to develop efficient practice habits (rather than simply focusing on minutes or days practiced). If you’re looking for a fun way to boost practice time before your spring recital, read on for how to implement it in your studio! This incentive takes place over 3 weeks. You’ll find all of the printables you need to promote and carry-out the incentive below. Note: Week 2 of the incentive uses 4 activities from our book “Shhh…Your Piano Teacher Thinks This is Practice” (as that book is also full of efficient practice strategies)… but if you don’t own the book you can come up with your own practice task sheets to still make it work. If you do own the book… your work is already done! 1. Decorate your studio with a tropical theme. Most dollar stores have Hawaiian-themed decor. I found great stuff on Oriental Trading. Practice incentives always work better if your entire studio is absorbed in the fun… so get festive and get decorating! 2. Print out the 11×17 promo poster and start promoting your start-date. 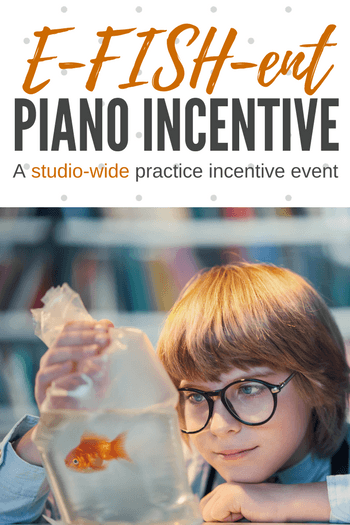 Post to your blog and Facebook page about the incentive, add it to your studio newsletter… anything you can do to get your piano kids excited. 3. Print out the parent hand-out and 3 weeks of practice tasks. You will hand out one of these sheets to every student for the next 3 weeks. Their task is to complete all of the challenges on the sheet before their next lesson. 4. Purchase a bunch of small plastic fish (like these ones I used) or print this sheet and cut them out in squares. Get one ziploc baggie for each student participating. Have your students write their name with a Sharpie on the baggie and pin it to your bulletin board, wall or visible area in your studio. This is your “studio fishpond”. For each week’s sheet that is completed, your student gets to add a fishy to their baggie. Those students who have 3 fish added by the time your incentive is over are entered into a draw to win a prize of your choosing. At our studio we gave away a Siamese Fighting Fish in a small tank. It was a VERY coveted prize… and it cost me $12 for everything. At our piano studio, it was everything “fish” for 3 weeks. We played fish-themed piano games, we used fishy crackers to name notes on the piano, we composed fish-themed mini-improv pieces in lessons (whole tone scales sound just like an aquarium theme to me!) and we really hyped up “Mr. Fortissimo Fishy” (the Siamese Fighting Fish Grand Prize). Our studio was vibrant and excited… and practicing efficiently! Enjoy the printables and have some fun!